Pica is the practice of craving substances with little or no nutritional value. No, we are not talking about ice cream! Most pica cravings involve non-food substances such as dirt or chalk. The word pica is Latin for magpie which is a bird notorious for eating almost anything.The majority of women will experience cravings during pregnancy; however most of these cravings are for things like pickles and ice cream. 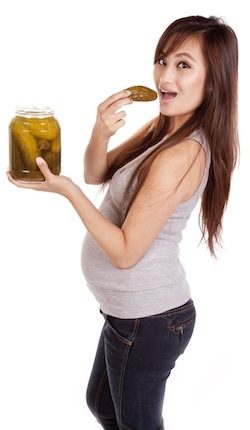 Pica cravings among pregnant women are less common but are most commonly seen in children. The reason that some women develop pica cravings during pregnancy is not known for certain. There is currently no identified cause though there may be a connection to iron deficiency. Some speculate that pica cravings are the body's attempt to obtain vitamins or minerals that are missing through normal food consumption. Sometimes pica cravings may be related to an underlying physical or mental illness. If you give into pica cravings and eat non-food substances it is potentially harmful to both you and the baby. Eating non-food substances may interfere with the nutrient absorption of healthy food substances and actually cause a deficiency. Pica substances are also a concern because non-food items may contain toxic or parasitic ingredients. Some pica craving substance may actually create weight gain. Other pica craving substances may wear down teeth or create bowel obstructions and constipation. Don't panic; it happens and is not abnormal. The most important thing is to inform you doctor and make sure you have a complete understanding of the specific risks associated with your particular cravings.